Bill O’Reilly confronted Donald Trump over why he got into an on-going feud with the Khan family on “The O’Reilly Factor” on Tuesday night. Trump has repeatedly attacked Khizr and Ghazala Khan, the Muslim parents of a fallen U.S. war hero, who spoke out against the GOP nominee at last week’s Democratic convention. O’Reilly asked Trump if “in hindsight” he should have simply ignored the Khan family. Also Read: Could the Khan Family Spell the End of Donald Trump? Trump blamed the press for making it a “big deal” and said he has the right to respond. O’Reilly agreed with Trump that the media played it up, but said, “It wasn’t wise to bring the mother in” to the drama, referring to Trump speculating that she didn’t speak at last week’s Democratic convention due to her religion. Trump didn’t back down, saying many people said the same thing and it wasn’t a big deal until he said it. O’Reilly advised Trump against “punching down,” telling him that the “left-winged press” will use it against him and the GOP nominee appeared to agree. 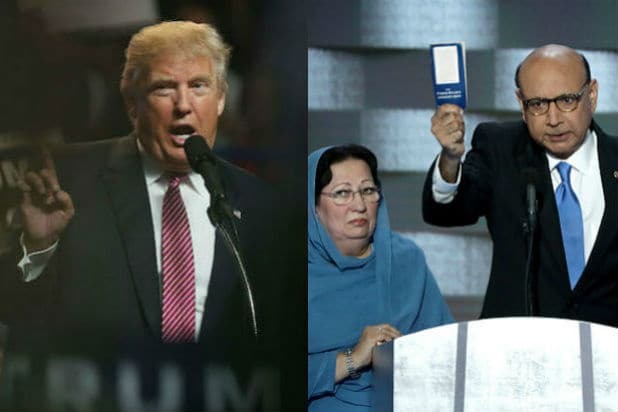 Here's a timeline of Donald Trump's fight with Muslim-American immigrants Khizr and Ghazala Khan, who have criticized his proposal to temporarily bar Muslims from entering the United States. Khizr Khan appears at the Democratic National Convention with his wife Ghazala. The Pakistani immigrants criticized Donald Trump's anti-Muslim rhetoric and invoked the name of their son Humayun Khan -- who sacrificed himself in Iraq in 2004 to save his unit. Khizr Khan said Trump has "sacrificed nothing" and offered Trump his personal copy of the U.S. Constitution. In an interview with George Stephanopoulos, Trump implied that Ghazala Khan did not speak at the convention because her husband would not allow it. He also said that he had made sacrifices, namely building his business empire and creating "thousands of jobs." Ghazala Khan published an op-ed in the Washington Post saying she declined to speak at the convention because she was overwhelmed with emotion at the memory of her son's death. "Donald Trump said he has made a lot of sacrifices. He doesn’t know what the word sacrifice means," she wrote. Trump tried to shift focus from himself and back to the issue of "radical Islamic terror," but was widely criticized for his apparent attack on parents of the fallen soldier. Trump's running mate, Indiana Gov. Mike Pence, issued a statement in Trump's defense that read in part, "Donald Trump and I believe that Captain Humayun Khan is an American hero and his family, like all Gold Star families, should be cherished by every American." Khizr Khan made the interview rounds, criticizing Trump for his statements against his family and Muslims in general. Trump responded with more tweets, one of which read, "Mr. Khan, who does not know me, viciously attacked me from the stage of the DNC and is now all over T.V. doing the same - Nice!" Arizona Senator and Vietnam veteran John McCain slammed Trump and defended the Khans in a statement. "While our party has bestowed upon him the nomination, it is not accompanied by unfettered license to defame those who are the best among us," he said. Could the Khan Family Spell the End of Donald Trump?